The passage is a “big step toward implementing science-based methods” and “marks the first substantial update to the federal fisheries management system in more than a decade,” said Nicole Vasilaros, senior vice president of the National Marine Manufacturers Association, a boating industry trade group. The author of the proposal, Mississippi Republican Sen. Roger Wicker, said one of the key features of the law is that it promises to help the National Oceanic and Atmospheric Administration incorporate data from fishermen, which he said would improve timeliness and accuracy. 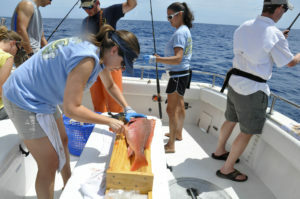 The data help inform fishing rules and regulations. The proposal also encourages regional fishery management councils to update policies for some recreational anglers who fish in the Gulf of Mexico, one of the most popular bodies of water among sport fishermen. The current rules are designed for commercial fishermen and are difficult for recreational anglers to follow, Wicker said. There are also a host of other tweaks designed to more efficiently manage recreational fishing.